Yes I know, iphone and android games are terrible, they're full of microtransactions, and playing them makes you a filthy casual. But let's be honest, it's a lot easier to play a game on your phone when you're bored in public than it is to whip out your 3ds. So let's talk about phone games we actually like and would recommend. 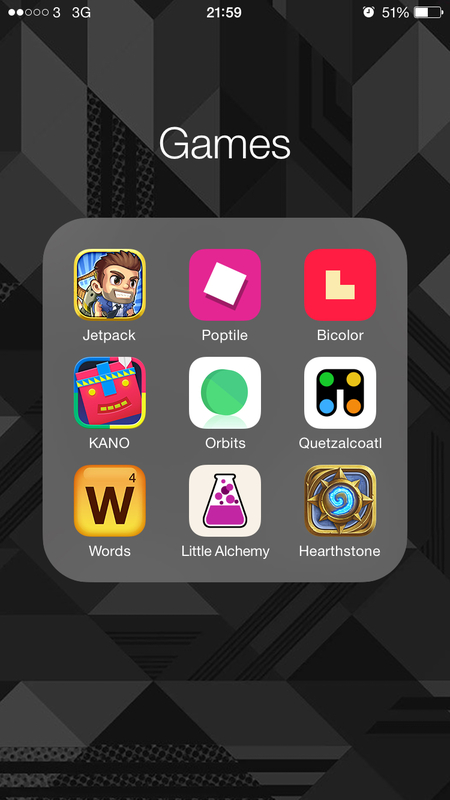 My current games folder. I mostly play hearthstone, words with friends, and orbits. I got Card Wars a few weeks ago when it was free, I think it normally costs four bucks. It's a surprisingly detailed card game and definitely captures the style of Adventure Time. I haven't actually looked into Hearthstone, but since I like card wars maybe I should check it out. Do they have Bejeweled 3 on phones? It's excellent and I can highly recommend it. Actually a lot of Pop-Cap's pre-EA merger games are great. But surprise surprise, EA ruined them. It annoys me that Words With Friends is popular instead of a proper licensed Scrabble game. Sure it's basically the same game but the bonus tiles are in different places and the letters score different amounts. Also it's just sort of sad that whoever makes Scrabble couldn't get their **** together. Should have been easy. Nightmare Mode: Words with Friends, Boardgame edition. Ghost trick. That is all. Defense witches is also fun if you like tower defense. Well, pretty sure there is a Scrabble game. Words with friends just got there first. Yeah that's what annoys me. Nobody at Scrabble HQ thought to get there first. I like Kairosofts particular brand of Sim games like Venture Town. It's a good mobile compromise that will provide enough entertainment for the cost imo. Oh man, I miss insanaquarium. Mostly playing the Injustice God amoung us mobile game. Also put some time into Fallout shelter although I have kind of done everything in that game now. Also play the Jurassic world tie in as well for some good old town building style game but with Dinosaurs. Thankfully she has been playing for like, two years and never put any money into it so that's cool. And the game is kinda neat if you're into Simpsons stuff. The most unexpected people show up. They put Grimey in it! The only time I've spent money on an iphone game was when I paid 99 cents for the full version of Fruit Ninja. That was years ago, before they updated it to push microtransactions like everything else. I got into Simpsons when it 1st cam out but got tired of it a long long time ago. It was fun for a while but it's all done for me. Actually I recently bought the walking dead season 2 and grim fandango on my iPhone they are tons of fun. I played a bunch of Dragonvale a few years ago. It was pretty fun. You have a dragon park where you breed dragons to create new ones. You can also mix different types to get rare ones and special event ones. Only problem is that it's one of those games where you have to click and wait a bunch.